Ash Maurya’s Running Lean is quickly becoming one of my goto references when talking to early-stage (Pre product/market fit) founders & entrepreneurs. yet somehow, it’s also concise, and packs a punch in less than 200 pgs. Don’t believe me? Here’s 14 tweetable takeaways to prove it! 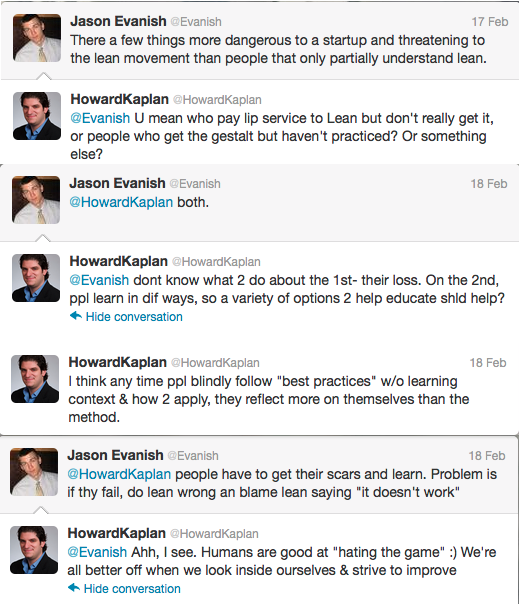 One night a month ago, @Evanish & I were having a conversation on Twitter about a subject we’re both passionate about: the Lean Startup Methodology. Since Jason knows more about practicing Lean (and the Customer Development teachings from which Lean grew) than most, his comments are rarely taken lightly. He shared his fear that the Lean “movement” would be threatened due to practitioners who only partially “get it”, inevitably fail, and then turn around and “blame” Lean for their lot in Startup life. How deep an understanding does one need to derive value from Lean Startup methods? Here’s where Eric Ries really deserves credit for having the courage to put out a methodology whose stated unit of progress is (validated) learning. Inevitably, at training sessions or conferences, I’d meet those who’d read our books and wanted advice on “properly” implementing what they’d read. I’d share my colleague’s quote (or my personal Voltaire favorite, “Perfect is the enemy of the good”) and encourage them that there is no “right” way or “wrong” way to follow a methodology, provided you stay true to it’s core tenets. That’s what makes a methodology so valuable where so many “best practices” fail. A methodology has value in that it points to a place in time, and provides an actionable strategy for how to get there, but stops short of prescribing specific step-by-step instructions for how to engage in every single situation. Lean practitioners who pursue the methodology for “traditional” business results only (i.e. revenue, customers, garnering PR, etc.) miss the point. Lean Startup is no magic bullet for building a business. It is a roadmap for learning what works (and what doesn’t) for your business, your product and your target market. It’s a series of concepts, ideas, strategies and actions you can take to swing the odds of success in your favor. It teaches Entrepreneurs how to think for themselves, in a fashion that creates as little “waste” as possible in the process. In terms of how “deep” an understanding one must have to derive value from Lean Startup methods, this seems to set the bar pretty low, right? I’d say, yes. However, that’s a benefit, not a liability. Lean Startup, like all continuous improvement methodologies, produces value in proportion to the number of iterations/cycles one manages to work through. As long as Entrepreneurs keep their heads in the right frame of mind (learning > results today), the barrier for entry to the 1st iteration should be low enough to easily get started, and provide a proportionally insightful outcome. As the iterations continue, our understanding deepens, and presumably results increase. This is where Alexander Osterwalder deserves great credit in describing his Business Model Canvas in terms of four levels of mastery. In my humble opinion, the more dogmatic practitioners are about the “right” or “wrong” way to practice, the less people feel empowered to try something new, and learn from their experience. Yes, clearly someone who’s practiced customer development for years will have a much deeper level of understanding, and will apply the framework of Lean in a way that builds upon and extends their experience. However, someone who’s just starting out is doing no great risk to their organization or to the “movement” of Lean Startup by trying (often failing, and picking themselves up again) to incorporate the key takeaways from Eric, Steve Blank, Jason or any other knowledgeable thought leader in the space. I should clarify, it doesn’t have to empower Cowboys. Notice I qualified the statement- “there’s no right or wrong way to follow a methodology provided you stay true to the core tenets”.That’s where Cowboys tend to get hung up in their quest to shoot first, aim second, and that’s where Lean practitioners have to focus to hold themselves accountable. Always Be Deploying. The core of the Lean Startup is the Build-Measure-Learn feedback loop. What matters is what we can prove, not what we “think we know”. This means releasing your core product early & often, and measuring how customers & prospects respond. The challenge comes after validated learning, and deciding whether to keep progressing down the same path, or pivoting to another path. Get Out of the Building. Within all great companies is a great product which solves a pain shared by a group of people. A product vision to scratch your own itch is great, but unless you’re personally going to buy millions of units of your product, you’ll want to get out of the office and meet those who share your pain. The Success Theater Is Closed. If the unit of progress in a Lean Startup is about learning, we have to make sure what we’re seeking out to learn is the stuff that truly matters. This may mean “traditional” metrics are more “vanity” metrics- helpful in making people feel good, but far less helpful when it comes to understanding what makes our business grow. Change can be scary, but few things are in a startup’s life are scarier than all “traditional” metrics going up & to the right while the bank account balance continues to dwindle. Isn’t it interesting to site back and watch the old become new again? While speaking with marketers after my session on Personas at Conversion Conference, it seemed to me a trend was (re)gaining traction. Over the past few months, the digital community at large has taken up the Personas mantle, and there have been many great articles written to help Marketers. As we wrote in Waiting for Your Cat To Bark, understanding your customers and enabling them to get what they came for is of utmost importance. This rings true in every interaction they have with your company, product or team. Personas remain one of the best tools out there to help Marketers transform what they know (or think they know, at times) about the customer base from the abstract, to the concrete. Persuasion Architecture personas are rooted in behavior because they describe a pace for gathering information/making decisions (quick vs. slow), and information bias (logical vs. emotional). Your sales process needs to account for and align with the four different and identifiable paths a Persona will take to make a purchase or try your product. It’s possible to cater to all four types of personas on one website, and even within one page of that site. Personas don’t represent groups of people as much as they represent groups of behaviors. I know this is hard to digest, but it actually makes things easier. If you let go of the false assumption that each of us has a type, and fits into one of these groups, things start to make a lot more sense. That’s because even though each of us has a preferred way of acting, and a preferred information focus, certain situations can make us act differently. This is one reason we here at FutureNow prefer to think of the personas as describing a mode of behavior rather than describing a particular kind of person. The Persona Canvas is a tool we use that maps the questions you hear from your customers, their motivations, and the topology of your personas within the context of four “decision mode” quadrants. 1) Products, brands and companies frequently have a “type” or “mode” associated with them too, and that can be part of what causes a person’s preferred mode to skew toward another mode of behavior and decision-making when purchasing a particular item. Technical products with lots of details, like computer hardware, for example, tend to fall into the Methodical quadrant. This can cause even the spontaneous types to act more methodically when purchasing them. But that’s not to say you won’t have competitive or emotional buyers purchasing computer hardware. 2) The circumstances in which a person is making a purchase can also influence their mode. Think of someone who makes those kinds of purchases for their department at work. They purchased a secondary hard drive for a colleague’s computer last month, and now another colleague has come to them with a similar request. They know just what they want, and where to go to get it. They are unlikely to need all the facts and details this time, because they already did that the last time they made a purchase. This situation is very different from the man looking for more storage for his home computer because he and his wife are about to have their first baby, and want to make sure they have enough storage for all the videos they plan to take in the next year or two. 3) Believe it or not, we may even shift modes several times while attempting to complete one purchase. Our stage in the buying process can influence our mode too. We may be much more methodical at earlier stages of the buying process, collecting lots of details, and comparing the stats for one product to those for another. By the time we’ve narrowed down our options, it’s possible we’ve reverted to our naturally preferred mode of decision-making; we just want to read some testimonials to see what other people thought of the products, before we make our final decision. The variety of reasons why people might have need of your product or service, the image your company presents, the nature of your product, and other factors that can skew persona behavior all will be evidenced in your Canvas. That’s where you’ll be able to see how those factors play out in your personas. If you’ve been to one of our trainings over the past few years, or seen any of us present at a conference, you’ve probably heard the line about the average tenure of a Chief Marketing Officer being less than the gestation period of an elephant. Well, it’s time for some new material. New research from executive search firm Spencer Stuart shows that CMOs are making it into their 3rd year with the same organization, on average, based on a review of the 100 most advertised brands in the U.S.
Ms. Charles goes on to point out an area that has improved but “is still highly underleveraged”, that of utilizing technology & tools to better tap into consumer insights- listening to the voice of the customer. Interesting she brings that up, as it dovetails with a another piece of research on CMOs, seemingly far more negative. Now before you get all hot and bothered by Scott’s comments, he’s simply reacting to the CMO Council’s published statistics. MediaPost spoke with the Executive Director of the CMO Council, Donovan Neale-May, and when you understand the lens through which he views the role of CMO, it makes sense why he’s led Scott to the conclusion above. Donovan defines the CMOs most critical role as “owning every facet of listening, learning, interacting, engaging, and optimizing the relationship with the customer, and understanding where the attrition, pain and aggravation is, and doing this in real time.” I like that definition, although I’d offer we need to add an explicit benefit/outcome- optimizing the relationship with the customer, to what end? As long as it’s help them achieve their goals, and by extension, our business goals, I’m on board. Doing so also reminds ourselves of our responsibility to our organization to be new age accountable marketers 🙂 I digress. Apparently this research seems to validate what Elisabeth Charles expressed in her Ad-age quote, underleveraged indeed. However, I think these two pieces of research, taken out of context, simply show (or aim to show) extremes on a continuum. This shouldn’t be a sky-is-falling blog post, there’s good news and opportunity here. As a marketing community as a whole, there’s still plenty of room for growth, but collectively *I think* we’re improving. I look at brands like Comcast (with Frank @ComcastCares), Dell (@RichardAtDell), JetBlue (@JetBlue), Southwest Airlines (@SouthwestAir) as signs of a positive trend. I look at service providers like BazaarVoice, who not only get it themselves, but can be legitimate resources to helping their client organizations improve their efforts to better listen and serve their customers. I look at CMOs like Barry Judge (BestBuy), Sam Decker (BazaarVoice), Patrick Moran (Mzinga) who are clear examples of accountable marketers, who know the value of (and have the discipline to) measure success and continually optimize, not to mention constantly listen, learn & interact with their customers. These signs point me to this trend accelerating in the future, despite the current research. I choose to see the glass half full, although I know, hope is not a strategy. All that said, I can be as optimistic as I choose to be, but I’d much rather listen to the marketing practitioners themselves, you guys out there with your feet on the street. Do you see a shift in your organization towards aligning your business objectives with your customers? Do you see the Marketing group and the Sales groups breaking down silo walls and collaborating on the same performance goals? Are you finding service providers and tool makers who help you leverage the social web to get closer to your audience, to better understand them, and to better service them? If so, we’d love to listen and learn from you, so please share with your community here and don’t be a stranger. “We” are smarter than “Me”. These are just a few of the staples of the digital world in which we now live, and each present opportunities for success, or potholes that must be navigated around as business owners & brands interact with their audience, prospects and customers. As some of you may know, I’ve recently decided to take the plunge, and make an honest woman of the one whose been by my side this past decade and a half (note to female readers: yes, I’m aware, I took a VERY long time getting around to the question, and yes I’m VERY lucky she said yes!) We’re having a destination wedding so we wanted to make sure we gave our guests as much planning time as possible, seeing as we’re the kind of friends who inconvenience you and make you come away on vacation with us 🙂 That meant getting the save the dates out uber-early (check) and then even getting the invitations out sooner than expected as well. The invitation buying process wasn’t exactly what I’d call easy, and online was ZERO help. Elka called us to let us know she rushed the delivery, so we wouldn’t be delayed from our original planned mailing date. Within a few days of her phone call, we received our order, much ahead of schedule. I wonder, how many soon to be brides has Kelly now recommended Papyrus to? Contrast that with the last remaining newspaper I’ll ever subscribe to in print form, the WSJ. For the past few months I experimented with reading the Journal online only, like I do every other newspaper I still read (a dwindling number these days, sadly). Ultimately I noted, I read more of the paper when I had it in print form than I did online only- I had a deeper engagement with it. Then in the mail (interesting to me that it wasn’t an email) I received a “professionals discount” with a very good rate for home delivery, and I decided it was time to resubscribe to print. The subscription process was smooth & easy, not unexpected although many other sites (and far too many newspaper sites) fail here, and I was emailed a confirmation upon completion. Imagine if you bought from Amazon, and your confirmation arrived, noting what books you had bought, how much you paid, what CC you used, etc… everything but the shipping/arrival date. It would never happen, right? Well, it happens every day with the WSJ! Great to know my subscription was confirmed, but would you believe I had to write back, not once, but twice before giving up and assuming I’d simply have to wait and see if the subscription ever actually started! Fail. Ironically enough, missing subscriptions must happen with some frequency, as evidenced by the fact that yesterday (a few days AFTER I started receiving delivery) I got an email telling me I should have started receiving the paper already. Where does this actually hurt? Well, seeing as the newspaper business seems to be fighting the banking industry for the title “most likely to be OOB” these days, you’d think they want new subscribers? I had the option to pass along my discount to other colleagues I thought would enjoy it. I wonder, why haven’t I passed it along to anyone yet? Then there’s the really ugly… and since I made a new years resolution to be more positive, and less snarky (it’s a two year old resolution!) I’ll change the name to protect the guilty! Our CTO and resident coffee roaster John (unlike me, who is our resident lives-at-starbucks-far-too-much-guy) was scouring the ‘net looking for a new source of beans. He knows we’ve talked to a few of the leading players in this space of late, and wanted to see what was out there. After a little hunting, he found just product he was looking for at, er, um, Bob’s House of Beans 🙂 We thought it was a little odd the logo didn’t resolve properly, but chalked it up to Firefox/Mac issues, and kept plugging along. Added beans to cart, check. Entered credit card info, check. Make purchase, fail. Try as we might, the shopping cart and backend merchant account just wouldn’t connect, and after five minutes of reloading, we abandoned. We tried once more later in the day (I assure you, purely as an experiment) and still couldn’t order. If you’re an online retailer, no matter how large or small, you simply have to be able to calculate the cost of downtime, and require some proactive monitoring to alert you while the problem is ongoing. In this case, the problem could have been on the bank side (I suspect not) but it’s really irellevant- the retailer lost the sale. This is conversion 101, and yet, these are the mistakes which are still out there on the web. If your site has some of these basic challenges, don’t get caught up in judgment (or let anyone else make you feel bad, myself included), it is what it is. What’s important is taking the steps to correct, early & often. Get yourself on a program, and commit to continually improving your customer experience. It’s the only way to grow in this day, age and economy! Do you think the new site accomplishes it’s objectives? I’m not sure they achieve their primary objective (although one must wonder if that’s really their #1 goal behind the scenes in Bristol, or do Advertisers trump Audience?) as “less” clutter is a relative term. I wouldn’t exactly describe the redesign as minimalist. There are some nice touches though, even if they’re slightly hidden (checkout the scoreboard on the homepage, above the top navigation). As for goal #2, after visiting last night I fell asleep dreaming of buying a new F150, and couldn’t figure out why the Ford homepage had so many clips from Sportscenter on it, so I’d call that a success! Well sports fans, here we go. Black Friday. Soon, Cyber Monday. (Forgive me for the brief digression, but did you know neither Black Friday nor Cyber Monday typically deliver results, in the form of conversions, er, sales, mainly just delivering traffic 🙁 Unsurprisingly, retail numbers thus far have been bleak, to say the least. Not every retailer is up to the same old tricks though. Sears, through a partnership with Yahoo is trying to capture the holiday spirit, and capitalize on the web sense of community to spur sales. Of course, they promise exclusive deals as part of the promotion 😉 . If history is any indicator, each of these efforts will result in traffic spikes (not only on websites but highways and mall parking lots as well!) of highly motivated would-be customers. These potential prospects certainly have a list of products in mind, or if they’re earlier on in the buying process, an idea of what type of product they’re shopping for. Everyone hates to be sold, but loves to buy. Buying is about the experience, above and beyond the “right price”. What will you do to convert those could-be customers into delighted customers? Plato said, “necessity is the mother of invention.” If Plato were faced with a marketing budget coming under fire to pare costs and brace for a long dark winter, I respectfully suggest he’d get focused on “inventing” some ideas around Optimization. Your traffic is coming to your website for a reason, and if your conversion rate is in the single digits, perhaps it’s time to consider what your audience is telling you, and do something about it. After all, you won’t have the same luxuries to keep spending $$ on driving an overabundance of traffic. Perhaps now is the time to capitalize on opportunity: the web is your home to listen not to what they say, but rather to what they do! We’re always here to help you listen, and turn your audience feedback into actionable (and continuous) website improvements. Tomorrow we’ll start to see a harbinger of things to come. Will Santa’s little elves be out in full force? Most definitely. But the larger question we want answered is, will the experience be enough to overcome the last stage of the buying process- reevaluation. So, in the name of research, go out and enjoy the deals… but let us know about the experience. Do you see more sites this weekend who deliver on their promises, or are your expectations continuing to outdistance the experience they provide? We want to know! Our audience does too, so please sound off in the comments. Guess what becomes more important? Yup, conversion. As online marketers are forced to reign in their spending (along with just about everyone else today), many may be tempted to cut their optimization budgets. After all, optimizing a website is w_o_r_k. It’s far easier to simply buy more traffic, when you need to generate greater profits. That strategy even works too, on a short enough time horizon, although admittedly more so in bull markets than bear ones. But in recessionary times (or those dangerously close to it like, say, now) those who have become addicted to Google’s PPC fix find themselves up a certain creek, and lacking an effective paddle. I made the case last month while talking to a group of Direct Marketers at the DMA, that increasing traffic is like a one night stand, where as conversion improvements are a long lasting love affair. When you increase conversion, the impact is permanent, and as you generate more traffic to your website, with your newly effective funnel, you generate exponentially more revenue than before. Far more so than simply incrementally increasing traffic. While we’re talking about traffic… you know what happens to traffic when consumer confidence is low? It drops. If that sounds hard, give us a call and we’ll show you it doesn’t have to be. Want a sneak peak into how? Well since you asked, Bryan would be happy to show you, along with the fine folks at Sitebrand. Enjoy! 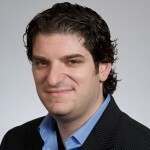 Wired’s (and Valleywag) Paul Boutin writes a eulogy for Blogs. Link-bait? Probably, but he certainly raised the ire of several in the online community, myself included. Heck, he even got me to crawl out from the rock I was hiding these past few months and pen a few words of commentary, in defense of blogging (yes, I recognize the irony 😉 . I think Mathew Ingram wrote the best counter to Paul’s argument, so I’ll let you hop off and read his discourse before returning to hear a few questions I’m pondering. Why does having a number of different authors make the blog any less “blog-like” – i.e. if there are still good blogs out there, albeit less personal and more representative of a group of persons who all share a similar view on a particular topic, why can’t that be considered a blog? Shouldn’t the litmus test be the value of the content they produce, regardless of the person(s) who created the content? Why does the fact that blogging about mainstream topics like presidential candidates makes it difficult to rank highly in google equate to “kill yr blog”? Google is all about relevance, always has been, always (most likely) will be. If the most relevant answer to a searcher’s query could be found on a personal (or professional) blog, it would rank high. For “Barack Obama”, aren’t most searchers looking for that wikipedia page, or the Fox News article (ahem, wouldn’t MSNBC be more likely?!) What about the blogger who writes about a passion topic, something like the greatest college basketball team, and wants to be able to connect with those who share that passion. Is this form of community no longer valid? Why does the “insult commenter” need to ruin the fun for the rest of us? Assigning so much power to those silly flame comments seems to ignore the power the rest of us have to ignore things that don’t add value. It’s like the reviews people post on Amazon, with a absurdly high (or low) score but no substantiation for their claims. People today seem to be far better equipped to deal with hype and BS, and tune out what doesn’t make sense in favor of what does. I strongly disagree that these silly one-off comments really degrade the experience the rest of us enjoy. As a writer, though, I’m onto the system’s [Twitter] real appeal: brevity. Bloggers today are expected to write clever, insightful, witty prose to compete with Huffington and The New York Times . Twitter’s character limit puts everyone back on equal footing. It lets amateurs quit agonizing over their writing and cut to the chase. Ok, so as long as you and I agree not everyone writes about topics covered by the mainstream media on a daily basis, I think Paul will agree with us that the platform still adds value. I’d love to try and have a meaningful and interactive and ongoing marketing optimization discussion, 140 characters at a time. I’d love to hear your thoughts in the comments- are you reading more or less blogs today than 4 years ago? … just to name a few! So if you’re out there blogging, please feel free to ignore the opening advice from Wired, and keep up the fine work- I’m sure your audience appreciates it. Sitting down to the watch the Sox game last night, I surfed over to my hometown paper and found an absolute gem of customer-centricity in the most unlikely of places – a cable television company. As someone who’s lived in a few different markets over the years, I’ve experienced Time-Warner, Comcast, Primestar, Cablevision, and Verizon, and I can tell you there is one common bond that stands out amongst all of Big Cable – the privilege each of the CSRs allowed me to feel for their gracious offering of their service to me 😉 . But alas, times perhaps have changed. Truth be told, what stopped me in my tracks when digitally thumbing through the Globe was not the headline, but the leading image of CC Chapman, all-around Podcaster-extraordinaire. Seems CC’s tv was on the fritz during a little thing called the 17th championship in Boston Celtics history, and he twitter blasted Comcast to make himself feel better (he should’ve realized in title-town, it takes a lot more than OD [original def] to keep a team down 😉 .) Here’s the amazing part – Comcast responded, via Twitter, within minutes. They also had a technician out to solve the problem…before the tip off of the next game! 1) Setting up Google alerts for your company and/or product name, and commit to spending an hour per day reading and responding honestly and in a human voice to the comments you read. Remember in the age in which we currently live, our heroes are more flawed like Jason Bourne, than the Rockwellian images of yesteryear. It’s ok to not be perfect, but you’ll get torched for not being honest. If you don’t believe me, see Pettitte, Andy and Clemens, Roger. 2) If Google alerts doesn’t give you enough fodder, try Technorati, or Twitter or Niche sites in your space, like Techmeme. Despite what the old commercial said, it’s tough to reach the end of the internet. There are plenty of services out there to help you comb through what’s out on the ‘net, but you may be surprised to see how much you can learn through sweat equity alone. 3) Go to sites that sell your product and have reviews. Mine through the treasure trove of data that your audience gives you about what works and what doesn’t about your product or service. What’s the vocabulary they use? In addition to learning why they hate your product or service at times, I’ll bet you a quarter you find new benefits you never considered that your audience is realizing as a result of your efforts. Bonus points if you use those benefits to rewrite some product copy. 4) If you don’t have reviews on your site (why not?– Is there something you are afraid of hearing? ), read your competitors’ reviews, and instead of trashing them, learn from them. Reach out to the consumer base, and offer a few free products in exchange for free flow of feedback. You can’t improve what you don’t measure. Those are just some top of mind ways you can get started. I’m positive the GrokDotCom audience base has far more, and even better, ideas for how they overcome these challenges, and learn from their current and past customers. Perhaps if we ask them politely, they’ll even share. Anyone care to share their stories & ideas in the comments below?